Today, October 31, 2017, is the 500th anniversary of the start of the Protestant Reformation when a German monk named Martin Luther nailed 95 theses to a church door in Germany. 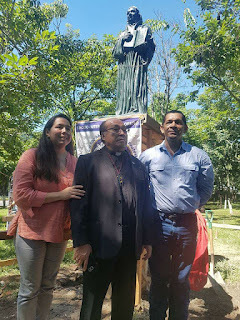 Today in El Salvador, protestants are continuing to make inroads on the dominance of the Roman Catholic church in the country. According to polling statistics published by La Prensa Grafica today, 45% of Salvadorans consider themselves Roman Catholic, 35% consider themselves protestant, 2% some other religion, and 17% profess no religion. This is a decline of 10 percentage points for the catholic faithful in the country since 2004. The Roman Catholic church is the only one officially recognized by the Constitution of El Salvador. Perhaps because of the growing numbers of protestants, there is now a proposal in the National Assembly to modify the constitution to recognize other denominations. Over the weekend, the municipal government of San Salvador unveiled renovations to Plaza Gerardo Barrios in the historic center of the city. The renovation features lighting, new pavement, fountains and other upgrades. The plaza is bordered by the Metropolitan Cathedral and the National Palace and is named for a 19th century general and president of El Salvador. The nighttime events were intended to portray a message of reclaiming important public spaces. Images of families strolling and taking selfies after dark in a zone often associated with gang-sponsored crime poured out of the Twitter feed of the city government. Temporary Protected Status -- will US really expel 300,000 law-abiding residents? Currently advocates for a just immigration system are lobbying Congress and the Trump administration to preserve Temporary Protected Status for immigrants from El Salvador, Honduras, Nicaragua and Haiti as well as other countries. 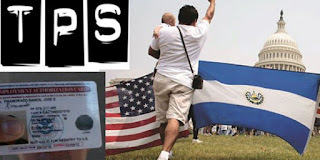 The largest group of TPS holders (195,000) are from El Salvador. 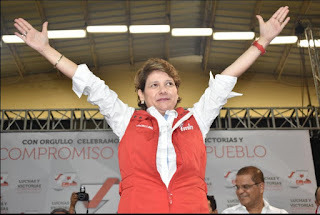 El Salvador's left wing party, the FMLN, has chosen Jackeline Rivera to be its candidate for mayor in the March 2018 elections. The party needed to choose a new candidate after expelling from the party, Nayib Bukele, the current mayor. Rivera is currently a deputy in the National Assembly for the department of Cuscatlán. Rivera shared details of her biography earlier this year in an interview at 102Nueve.com. Rivera was born in the municipality of Cinquera, where her father was an early guerrilla leader. She was a child soldier, joining one of the five member groups of the FMLN, the Fuerzas Populares de Liberación (FPL) in 1979 when she was only 8 years old. At age 16 she was a radio operator for the FMLN operating in the mountains. After the war, Rivera studied law and became a lawyer. Eventually she reached her current position in the National Assembly. In a small courtroom in the town of San Francisco Gotera, largely unnoticed by the world, a major human rights trial is taking place. The trial seeks to establish the responsibility of high ranking officers of the Salvadoran military for the 1981 massacre at El Mozote. In El Mozote and the surrounding small communities, as many as one thousand civilians -- children, the elderly, women and men -- were brutally killed by the Salvadoran military between December 9 and 11, 1981. It is a crime the judge has already declared a "crime against humanity." It is possible to follow along with the testimony in English translations. So far, family members of those who died at El Mozote, and who witnessed some of those days of terror have been testifying. After being expelled from the FMLN, Nayib Bukele has decided to run for president of El Salvador in 2019. In a 20 minute discourse on Facebook Live Sunday night, Bukele announced that he will not fight the expulsion in the courts, but will instead form a new political movement to achieve the presidency. Bukele spent much of his time talking about his roots in the FMLN and his father's friendship with Schafik Handal. But Bukele asserted that the FMLN is now controlled by a small leadership group which is corrupt and seeks only to protect its own narrow interests and corruption. On October 6, the Constitutional Chamber of El Salvador's Supreme Court announced that it had ordered the government to provide measures of protection for a family subject to threats and attacks from one of El Salvador's criminal gangs. 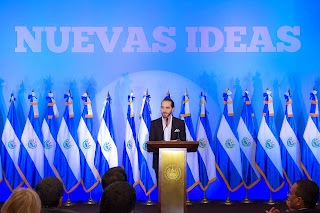 The mayor of San Salvador, Nayib Bukele, uses the slogan "Nuevas Ideas" -- New Ideas. Today the traditional leadership of the FMLN showed that new ideas don't have a place within the party, and expelled Bukele. The Ethics Tribunal of the FMLN expelled Bukele from the left wing party for violating the principles and statutes of the party. 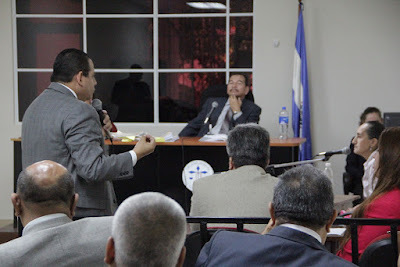 Ostensibly, the reason for the expulsion was a claim that Bukele had verbally abused a female FMLN lawyer during a meeting of the San Salvador municipal council. Yet the writing had been on the wall for weeks. 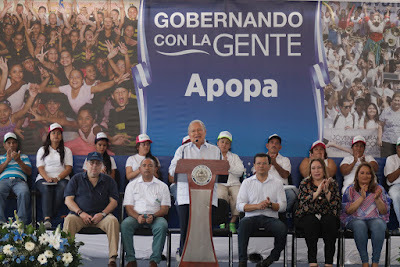 Senior FMLN leaders like Medardo Gonzales had been publicly complaining about Bukele, and seemed to be looking for a pretext to justify separating the FMLN from the brash young mayor of the capital city. The Latin American Public Opinion Project and Inter-American Dialogue have collaborated to produce a working paper titled Beneath the Violence: How Insecurity Shapes Daily Life and Emigration in Central America. Using public opinion polling data from the Latin American Public Opinion Project, the study looks at how perceptions of crime and violence affect the routine of daily life for persons living in Central America, particularly the Northern Triangle countries of El Salvador, Guatemala and Honduras. There has been a dramatic surge in homicides in El Salvador in the past two weeks. Until September 20, homicide rates were running below 10 homicides a day in September, with some days tallying as few as 3 or 4 homicides. Yet something appeared to change on September 21. The number of daily murders across El Salvador jumped above 20, including a high of 40 on September 23. The average in the 12 days since September 21 has been 26 daily murders. (Note -- the daily totals for September 17 and 30 were not available in what Salvadoran police have published). On many Saturdays throughout the year, president Salvador Sánchez Cerén takes his executive branch out to some community throughout the country. The Festival para el Buen Vivir (Festival for Good Living) brings in one locations a multitude of government agencies. The idea is that citizens from the local community will better be able to access government services in this one day when the services come to town. There are free wellness checks and dental visits, cultural exhibits and lots of free handouts.